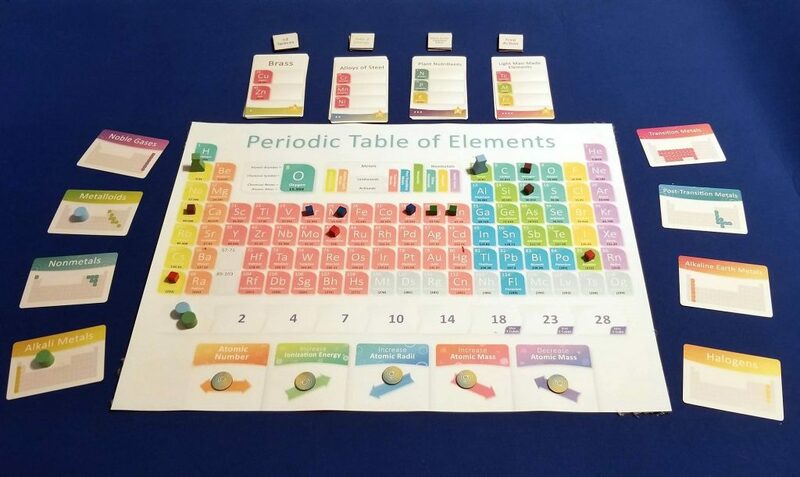 In the game of Periodic: a Game of the Elements (henceforth referred to as simply Periodic), the players compete to collect sets of elements and advance their research by moving through the periodic table. Performing this research takes energy, but there’s only so much of it to go around. Players will need to use their reserves efficiently to discover the elements needed to complete the Goal cards and advance their way up the Achievement track. When the game ends, points are earned from completed goals as well as the Achievement track and the player with the most points wins. The setup for Periodic is relatively easy. The game board is laid out and the 8 Element Group cards are arranged around it randomly, 4 to either side of the board. The Goal cards are separated by color and shuffled into four face down decks. These are placed above the game board and the top card of each is turned face up. The Goal cards depict certain collections of elements. The Goal cubes which correspond to the Goal cards are then placed onto each of these elements, the bonus tiles for each Goal card stack are placed above their respective Goal cards, and the lab tokens are set off to the side. Finally one energy is placed onto each of the Periodic Trends beneath the periodic table. After choosing their player color and collecting their pieces, each player receives some energy to begin the game with. 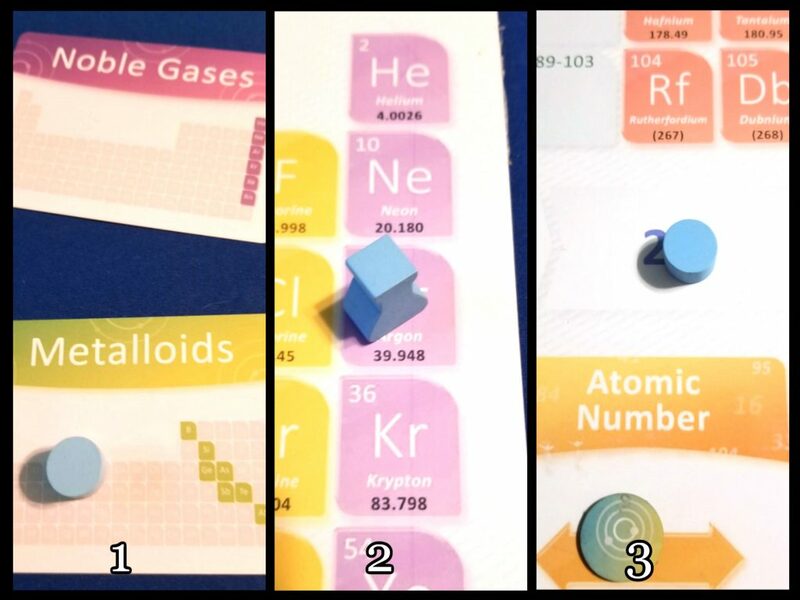 Then, once a starting player has been chosen, each player will place one of their Track markers onto one of the Element Group cards (dictated by turn order), their flask onto the lowest numbered element which corresponds to that element group, and then the other Track marker onto the first spot of the Achievement track. Now you’re ready to being playing Periodic. 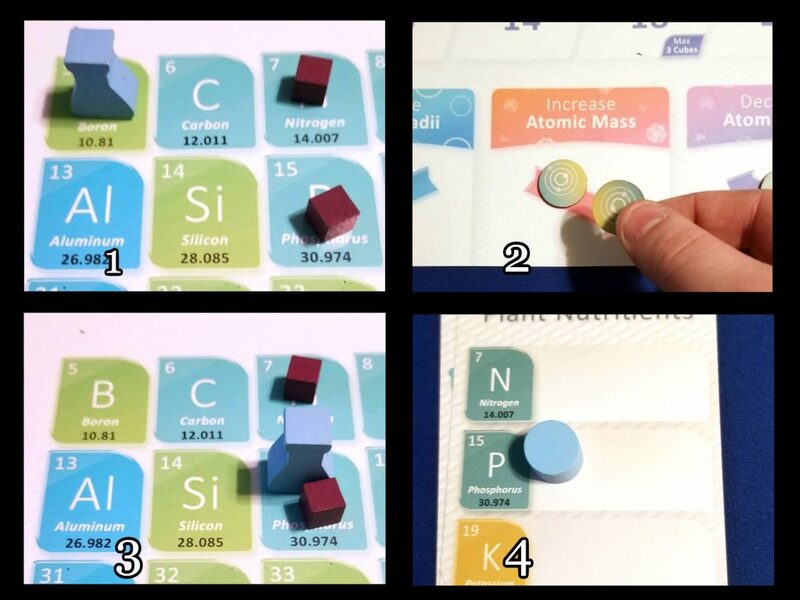 In Periodic, players will use energy in order to move their flasks around the game board so they can discover elements needed to meet the requirements of the Goal cards. By placing energy onto or removing energy from a Periodic trend, the player can then move their flask in the indicated direction 1 to 5 times. If the movement causes the flask to end on a space with a Goal cube on it, then the player places one of their Research cubes onto the matching Goal card to show that they have discovered that element. If the player placed energy, then additional energy can be spent during a player’s turn in order to move multiple times and in multiple directions if the player wishes. If any player discovers all of the elements on a Goal card, then that card is scored. Any players with just 1 Research cube on the card receive a 3 point lab token. Any players with 2 Research cubes on the card receive a 5 point token. The player that completed the card doesn’t receive any lab tokens but collects the card instead. Then a new card is turned face up to replace it and the matching Goal cubes are placed accordingly. Blue spends an energy to increase their atomic mass which allows them to discover phosphorous. They then place one of their markers onto the matching Goal card. During the set up, the Element Group cards were arranged around the playing area and the players placed one of their Track markers onto one of them. In order to advance along the Achievement track, the player looks at the next Element Group card clockwise from their marker’s current position and then attempts to end their turn with their flask on one of the elements that fall within that group. If they do this, they place their marker onto that card and then advance their other marker one space on the Achievement track. As we will see momentarily, this will provide the players with points at the end of the game. Blue needs to end their turn on one of the Noble Gases in order to advance along the Achievement track. Having done so, they are able to move their marker up a space into the #2 spot. The end game of Periodic is triggered once a player causes one of the following conditions to be met: 2 of the Goal card stacks are empty, 1 Goal card stack is empty and one player has made it to one of the last 3 spaces of the Achievement track, or 2 players have made it into one of the last 3 spaces of the Achievement track. Then each other player gets one additional turn. Once this is done, the scores are tallied and the player with the most points wins. Players earn points from completed Goal cards, collected lab tokens, leftover Research cubes which have been placed onto uncompleted Goal cards, and Achievement track progress. If you’ve read my past reviews of Cytosis and Subatomic then you undoubtedly know that I’m a big fan of Genius Games. I am consistently impressed by John Coveyou’s ability to gamify the science behind everyday things. I’ve always wondered what the world looks like through a game designer’s eyes. Being able to look down at a periodic table of the elements and see a game there is just something that baffles me. Yet John Coveyou did it and it works. In his past games, John has turned actual scientific processes into games. Cytosis gamifies the way that cells take in nutrition and expel waste while Subatomic has the players manipulating subatomic particles in order to create protons, electrons, and neutrons and then combine these to create atoms. Periodic, though, is something different altogether. In Periodic, you’re not combining things together to create new things. Instead you’re learning about the things that already exist by exploring the structure in which the data is organized. It’s like learning about a person by sifting through their dossier in a filing cabinet. While that has the potential to be interesting and informative, the process itself isn’t very exciting. It’s easy to get excited about smashing atomic bits together to create things. It’s a lot harder to get excited about looking at a chart (unless you’re my fellow writer Andrew Plassard!). If you can get past the theme, though, you’ll find a game that might surprise you. On paper, Periodic is a game about efficient resource management and route planning. How do you accomplish the most that you possibly can in a single turn using just the energy that you have at your disposal? At its heart, though, Periodic is a fast-paced racing game. Those Goal cards fill up fast and the Achievement track is an always ticking clock. You’re constantly forced to choose between generalization or specialization. Do you focus all of your efforts on a single Goal card or do you spread yourself across multiples? If you end your movement here, does it provide an easy opening for your opponents to capitalize and score major points? Are the personal gains from ending your turn there really worth it or should you wait and see what happens next? There’s a constant pressure to keep moving while at the same time you feel the same pressure to stand still and hold your ground. These conflicting urges create an interesting tension and that tension ramps up the closer you get to the end game. Aside from wishing that the theme were a bit more exciting, the only other negative that I can find in this game is that, as of this writing, there is no way to change up the turn order. While this doesn’t affect the game in any really noticeable way, it was pointed out to me in at least one gaming session that if two players were racing to get to the end of the Achievement track and were able to advance on each and every turn, then the player going first in turn order would always win. This is important because the final 3 spaces on that track can only accommodate certain numbers of players. If you reach the end first, then the people coming up behind you will have to settle for the second to last spot. It’s only 5 points, but in a tight race, that 5 points could make all the difference. I understand that the final round of the game is designed so that every player will have an equal number of turns and this would be impossible to calculate with the starting player token constantly shifting positions, but the inability to change the turn order is still worth mentioning. At the end of the day, though, I really enjoy Periodic. While it’s not Genius Games’s strongest game, it’s still a very good one. I like the fast pace of the game and I appreciate the challenges that are presented to me. And just like all of Genius Games’s offerings, I definitely applaud Periodic’s devious educational nature. John Coveyou’s games always teach you something even when you’re not aware you’re learning it. Once you see the Periodic Trends as more than just spots to place energy tokens onto, you realize that these are real world concepts that are accurately reflected in the way that your flask token is moving along the periodic table and before you know it, you’re Googling periodic trends. And that right there is the magic that Genius Games consistently brings to the table. The experience expands beyond the boundaries of the table top. Their games don’t just make you a better game player, they make you a smarter human.